If you like action packed films where bullets and fists fly this is definitely the movie for you. Skillfully directed by Jaume Collet-Serra (“Unknown”, “Non-Stop”) it is a masterpiece of movement. Run down, burned out Jimmy Conlon (Liam Neeson) is a pathetic character- at the beginning of the movie. Estranged from his son Michael (Joel Kinnaman) for five years he leads a lonely and depressing life as an alcoholic has been. Michael Conlon is as straight as an arrow and has no desire to follow in his father’s shoot ‘em up footsteps. With a pregnant wife and two little girls he makes an honest wage as a limo driver while mentoring fatherless youth on the side. Meanwhile Jimmy’s old friend Shawn MacGuire (Ed Harris) lives well on the proceeds of his legit and not so legit Brooklyn businesses. Shawn looks out for his old buddy Jimmy who was once known as The Gravedigger because he was Shawn’s favorite hitman. Meanwhile Shawn is trying to train his son Danny (Boyd Holbrook) to take over the family business. But Danny is a drug addicted, out of control punk who gets mixed up with some professional Albanian criminals who want to work out a big drug deal with old man MacGuire. When Danny boy can’t deliver Dad as guaranteed the proverbial crap hits the fan. From then on it’s all about blood flying. Michael witnesses Danny taking out the Albanians and becomes a target for Danny who wants to make sure no one can turn him in. Shawn warns Jimmy that Danny and his boys are after Michael and asks Jimmy to reason with his upstanding son. Meanwhile Shawn tries to keep his loose cannon son under control. Self defense means nothing to Shawn when his beloved offspring is involved. Now Michael is on Shawn’s hitlist and Jimmy must pull himself together to save his son and the daughter-in-law and granddaughters he has never met. Pursued by Shawn’s hired guns, led by Andrew Price (Common) and the New York police (clean and dirty) led by Detective John Harding (Vincent D’Onofrio) Jimmy and Michael are on the run trying to stay alive until the situation can be resolved. 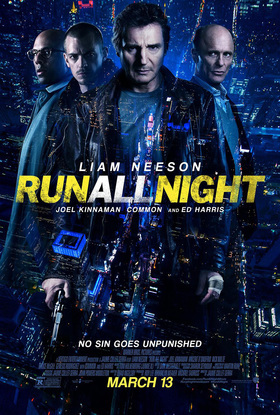 With amazing chase sequences, incredible gun battles, and hand to hand combat that makes the viewer cringe “Run All Night” is a fight until the end. Liam Neeson is undoubtedly the most amazing action hero/antihero in years. He is able to make you feel sorry for Jimmy Conlon even when you despise what he has done. His goal is not to “do the right thing” but to save his family. D’Onofrio is the quintessential New York City cop and his years on “Law and Order Criminal Intent” do him in good stead in this film. Shots of New York City from Queens to Brooklyn to Manhattan make it worth it even if nothing else does. How often do you get to see a chase sequence in the NYC projects? If you don’t see another action movie this year see this one.